Highest quality outdoor vinyl double strip kit you can buy. Graphics are precut and ready to mount. Graphic kit is PRECUT 20 piece and ready to install in a variety of colors. 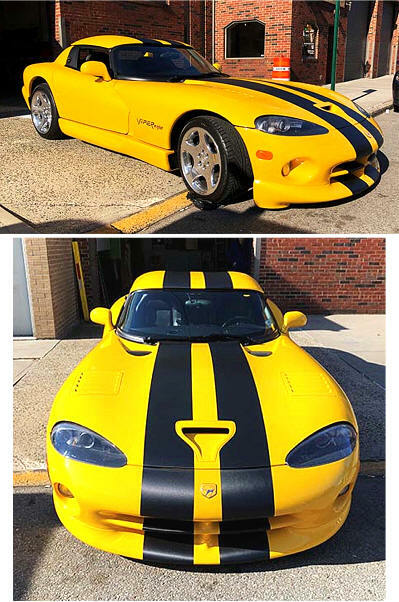 Make your '03-'06 Dodge Viper Roadster "Tough-looking" with this Bumper, Hood and Rear Deck Lid Rally Stripe Graphics kit. This stripe package is not just a box of 8" (20.32cm) straight strips. Our graphic kit consists of pre-fitted and contoured pieces as shown in the illustration - straight stripes will not work on this vehicle. Thus, due to the fact that this kit is created specifically for the '03-'06 Dodge Viper Roadster (convertible), it will not fit any other vehicle. Stripe width is approximately 8" (20.32cm) and set for a center space of 4" (101.60mm) at time of installation. *Professional installation only. 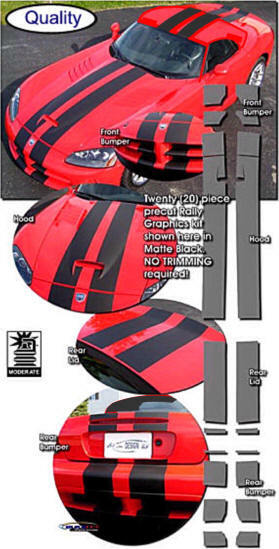 Graphic kit is PRECUT and ready to install in a wide variety of colors - slight final trimming needed as required by professional installers. Same exact kit as above but made of - But Special colors. See drop down menu for pricing. Matches kit above. Enough material to finish your Spoiler. You trim to length. Highest quality outdoor vinyl double strip kit you can buy. Graphics are precut and ready to mount. Graphic kit is PRECUT 20 piece and ready to install in a variety of colors. Make your '03-'06 Dodge Viper "Tough-looking" with this Bumper, Hood and Rear Deck Lid Rally Stripe Graphics kit. This stripe package is not just a box of 8" (20.32cm) straight strips. Our graphic kit consists of pre-fitted and contoured pieces as shown in the illustration - straight stripes will not work on this vehicle. Thus, due to the fact that this kit is created specifically for the '03-'06 Dodge Viper (coupe), it will not fit any other vehicle. Stripe width is approximately 8" (20.32cm) and set for a center space of 4" (101.60mm) at time of installation.